Sun, 14 Dec 2008 | Published in I Was There . 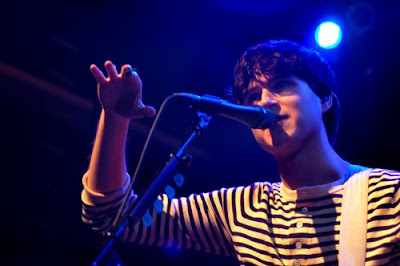 . .
With one of the best albums of the year, New York’s own Vampire Weekend concluded their 5 night sold-out run Saturday night at Terminal 5 with a spirited hour-long set. The first snow of the season didn’t slow down the crowd a bit and the venue was packed for the two warm-up local bands which the audience seemed very familiar with- Air Bombay and Fiasco. 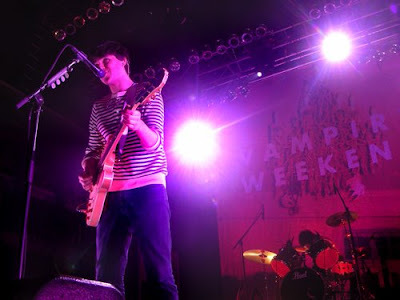 Vampire Weekend took the stage around 10 PM and their performance was energetic and vibrant. Their upbeat sound, which mixes together off-beat percussion with bright guitar rhythms, was even more fun in person and the eclectic crowd danced along with exuberance throughout the show. The foursome started off their set fittingly with “Mansford Roof,” the single that started it all for them and they continued with tracks off their freshmen album including “I Stand Corrected” and their hit “A-Punk.” Midway through the show the band welcomed out a string quartet which added an interesting spin to songs like “M79” (about the uptown bus line) and “Ottoman,” their cut off the Nick and Nora’s Soundtrack album. They also mixed in two very diverse but interesting covers songs- Blondie’s “X-Offender” and Fleetwood Mac’s late 80’s hit “Everywhere” which they pulled off with verve. They closed the show with their fan-favorite “Walcott” and thanked the crowd for all the hometown support.